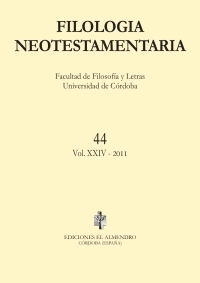 The FILOLOGÍA NEOTESTAMENTARIA journal is the result of initiative taken at the Chair of Greek Philology of the Department of Antiquities of the University of Córdoba, Spain. Within its Scope lies every aspect of New Testament Greek philology, namely textual criticism, grammar, semantics, lexicography and eventually semiotics and its relationship with Classical or Hellenistic Greek. It is published in Córdoba (Spain) by EDICIONES EL ALMENDRO DE CÓRDOBA, SL once a year (September). Board of Editors: C.B. AMPHOUX (France); N. BAUMERT (Germany); D.A. BLACK (USA); F.E. BRENK (Italy); J.K. ELLIOTT (United Kingdom); A. HILHORST (The Netherlands); G.H.R. HORSLEY (Australia); J.A.L. LEE (Australia); C. MARUCCI (Italy); G. MUSSIES (The Netherlands); D. PARKER (United Kingdom); A. PIÑERO (Spain); S.E. PORTER (Canada); M. SILVA (USA); S. WONG (Hong Kong). For information about subscriptions to Filología Neotestamentaria or about sending books for review, please click here.